French army of 3 corps under Dumouriez assaults Turin, destroying the Piedmont corps in the city and occupying it (1m Fr : 8i, 1c Pie). French troops successfully assault Brussels, occupying it (1i Au). Prussian army of 2 corps under Brunswick assaults Dresden but the Saxon defenders repel them (5i Pr : 4i Sax). Prussian troops occupy Erfurt. A strong British Fleet takes up station in the Baltic Sea causing Russia to cancel their planned invasion of Sweden. The Danish fleet attacks a British fleet in the Channel (29 : 12) but is beaten (Linear Attack vs Linear Attack, 3 Dan : 2 GB). GB retains 3 hulks, Denmark 1. Russian corps marching from St. Petersburg take Sveaborg by coup de main. Dumouriez concentrates 4 corps to attack Wurmser's 3 corps west of the main Austrian force in Milan, taking significant foraging losses (5m). The battle (54 Fr : 29 Au) goes poorly (Escalated Assault vs Defend, 10m, 2i, 1c Fr : 8i Au) and Dumouriez retreats to Piacenza. Mack counterattacks with 6 corps, sending a further corps to retake Turin, which it successfully does. The battle in Piacenza (54 Au : 41 Fr) is a hard fought Austrian victory (Echelon vs Defend, 10i Au : 6m, 1c Fr), Dumouriez retreats to his depot in Grenoble. General Dumouriez is brought before the Directory on two charges of treason and cowardice but is exonerated. Prussia is unable to break into Dresden. Turkey is unable to break into Tunis, despite a large number of Tunisian troops starving. Spanish troops break into Lisbon, destroying the Portuguese corps and occupying the city (2i Sp : 8i, 1c Por), while Neapolitan troops occupy Rome. Turkish troops cross the Austrian frontier, 1 corps force marching to the gates of Vienna and one besieging Ofen. A follow-on force of two corps under Achmed Pasha encounter an Insurrection Corps and are forced to retreat after a short battle. Turkish forces are unable to break into Tunis. The Austrian garrison of Vienna starves (1i) just as an Austrian corps arrives and beats the besieging Turkish feudal corps, saving the capital. The Turkish corps at Ofen is similarly defeated by the Insurrection corps and forced to retreat. The main Austrian army of 7 corps concentrates in Turin. A force of two Prussian corps annihilates the Polish army in a lop-sided field battle (Escalated Assault vs Cordon, 2i Pr : 5i, 3c Pol), Prussian troops then assault and occupy Warsaw. Dresden holds out for another turn, however. GB trades with all eligible ports, does not deny US trade. France conducts Levée en Masse, triggering Vendée revolt. Russia and Great Britain reach a settlement in their brief Baltic war, returning to the status quo ante bellum. Russian troops mass in Baltic ports in preparation for transshipment to Sweden. His ranks swollen with “volunteers”, Dumouriez’ command expands to 6 corps. Wasting no time he throws this force at the 7 battered Austrian corps under Mack outside Turin. The subsequent battle (82 Fr : 49 Au) is the first French victory of the war by the narrowest of margins (Echelon vs Defend, 9m Fr : 11i, 4c Au). So in doubt was the outcome that after watching a large part of his force rout, Dumouriez withdrew his command and gave instructions for the lines of retreat. The day was carried when a young 24 year old chef de brigade Lazar Hoche spotted a gap created by a routing Austrian unit and on his own initiative led his cavalry division to exploit the gap. Within 20 minutes the Austrian position had crumbled and only a heroic sacrifice of Austrian light cavalry screened the retreat of the main Austrian body from an energetic pursuit. A courier was quickly sent to interrupt Dumouriez, as he wrote yet another letter of apology to the Directory, informing him that he had won the battle. French troops enter Turin. Another corps of militia enters Zurich and informs the people they are now free citizens of the glorious French Republic. Fresh Turkish forces march deep into Austria and Hungary. The 1st Insurrection Corps defeats 3 Turkish corps in a 2-day battle at Ofen (Assault vs Cordon, Assault vs Defend, 5fi, 1c Tu : 4m Au) and the 3 Austrian corps defending Vienna drive off 3 Turkish corps under Achmed Pasha (Probe vs Defend, 3fi, 2fc Tu : 2m Au). The only Turkish success comes in southern Hungary, as a follow up force of 3 corps under the grand Vizier smashes the 2nd Insurrection Corps (Assault vs Escalated Counterattack, 2fi Tu : 8m, 3c Au) outside Ezsek. Rumours of chaos in the Turkish government abound (Tu enters the fiasco zone). Mack pulls his army back to Mantua, forcing a French corps to take shelter inside the city. Prussian troops march south into Bohemia to bolster their hard-pressed ally. Conditions in the besieged city of Dresden worsen but the garrison holds. Poland is dismantled, the provinces of Posen and Masovia are reintegrated into the kingdom of Prussia, with West Galicia as a protectorate. Spanish troops land in Leghorn and a Neapolitan corps marches towards Bologna. With their interior overrun by Turks and their dwindling army in Italy pursued by Dumouriez’ masses of conscripts, Austria sues for peace, joined at the peace table by their Prussian ally. French gains along the Rhine and in Italy (Piedmont is officially ceded to France) are recognized as a fait accompli. The Treaty of Mantua stipulates that Holland is to be in the French sphere of interest, while everything east of the Rhine falls into the German sphere. The prestige won at the peaces table enable France to conclude treaties of friendship with Turkey and Spain, and give a shot in the arm to Grand Vizier Mehmed Pasha’s beleaguered government. A cabal of Janissary officers plotting a coup are quickly uncovered and shot after a brief show trial, restoring some semblance of peace to the Ottoman Empire. French troops occupy Cologne. The Vendee revolt ends. Turkish and Egyptian troops finally capture Tunis. After a long siege Dresden capitulates to the Prussians; Prussian commanders “lose control” of their troops and the city is sacked. Frankfurt is occupied. Spanish troops occupy Bologna and Florence, and lay siege to Algiers. 2 Russian corps under Suvarov (including the Imperial Guard) land at Stockhom but are driven off by the Swedish field army (Assault vs Defend, 2m, 3i Ru : 1i Swe). The Swedes drive Suvarov north but a 2nd battle is inconclusive (Assault vs Defend, 2i Ru : 1i Swe) as a the Swedes can make no impression on the stalwart Russian defence. 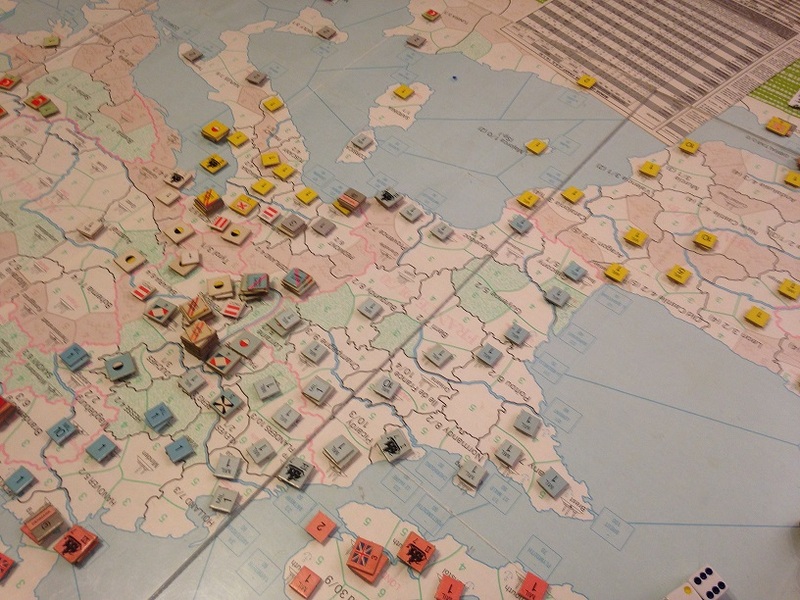 Contact is broken after the first day as both sides withdraw in good order. Austrian troops mass on the Bavarian border. Spanish troops break into Algiers and take the city. Suvarov keeps his distance from the Swedish army and requests more troops. A perturbed Catherine the Great agrees and 2 more corps ready for transport. Prussian tensions with Great Britain come to a head all of a sudden as Prussia claims that the northern German territories east of the Rhine should be brought under exclusive Prussian protection according to the treaty of Mantua. William Pitt the Younger scoffs at the Prussian claims and is unanimously supported by parliament. Prussia wastes no time in declaring war and their troops invade Hanover and Hesse, capturing Kessel and laying siege to Hanover. Austrian corps assault Munich and Stuttgart but are repulsed. Turkey moves to reconstitute the glory of the Ottoman empire, invading Tripolitania and Cyrenaica. Benghazi falls quickly but Tripoli holds out. Spanish troops land in Sardinia, occupying Cagliari. Suvarov moves south, bypassing Stockholm and linking up with 2 freshly landed Russian corps at Norrkoping. The siege of Munich continues, but Austrian troops capture Stuttgart and Freiburg after their garrisons run out of provisions. 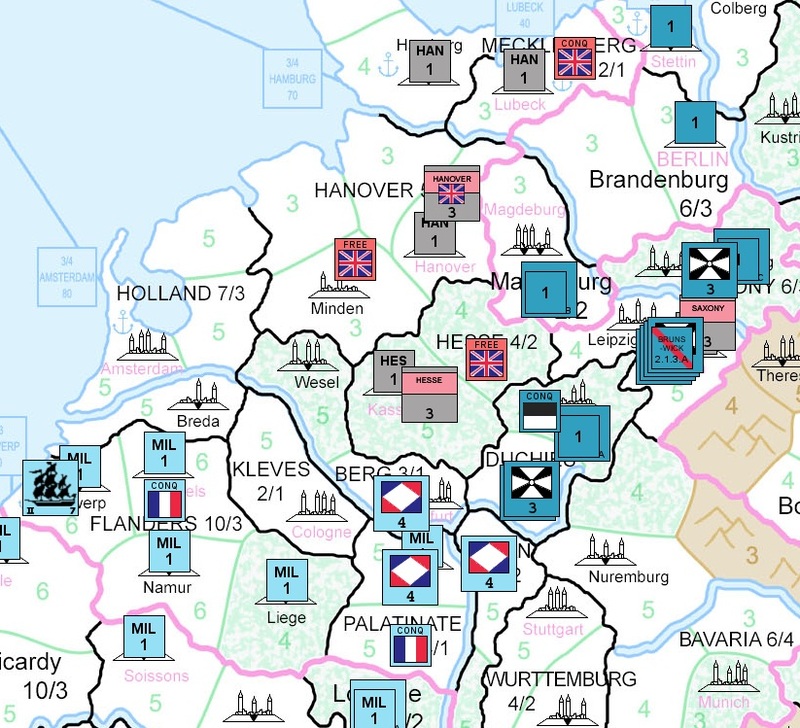 Prussia captures Lubeck and Hanover. The reinforced Russian army in Sweden marches on Stockholm once more. 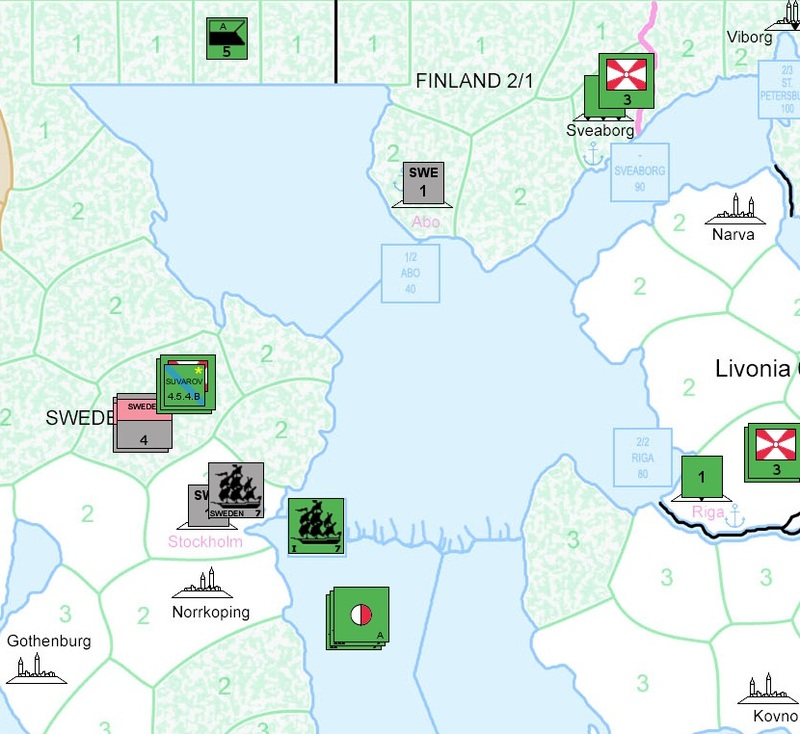 With some luck, Suvarov manages to break the Swedes (Echelon vs Cordon, 3m, 1i Ru : 6i, 1c Swe) in the ensuing battle, who retreat south to Malmo to lick their wounds. Stockhom swiftly capitulates. The Swedish fleet weighs anchor to escape capture but is destroyed in the ensuing battle with the much stronger Russian fleet. 2 Russian hulks make it to Riga, 3 Swedish ships are sunk and 9 Swedish hulks make it to the protection of friendly shore batteries and are moved south to Malmo. A Spanish army under De La Union lands in Morocco and beats the Moroccan army in a short fight (Assault vs Cordon, 1i Sp : 3i, 1c Mor), occupying Tangiers. The siege of Tripoli drags on. British troops take possession of the strategic island of Malta. An expeditionary corps lands in Konigsberg to annoy the Prussians. Amsterdam surrenders to the French, finally accepting the freedom of their people under benevolent Republican rule. Munich holds out for a third month under siege by Austria. Turkish troops storm Tripoli, capturing it. The redcoats take possession of Konigsberg. Chaos erupts in the British government as King George III, plagued since 1788 by bouts of madness (leading him to be dubbed in many circles the "Matt King"), suffers a complete relapse. With the King unable to give the speech form the throne or fulfill any of his official capacities, Pitt the Younger (oft-times called Pat affectionately by his friends) proposes a regency by the Prince of Wales lest the British government fall into paralysis. Privately Pitt blames the foreign policy failures of 1792 on the King's erratic behaviour, and seeks via the Regency bill to stabilize the government under his firm hand. This proposal, widely supported by Parliament nevertheless meets stern resistance from the Prince himself. Seeing the Regency bill for what it is as a deliberate attempt by Parliament to undermine the remaining powers of the Monarchy, he declares that Pitt's proposal "will produce weakness, disorder and insecurity in every branch of administration". With the catatonic George III showing no sign of recovery, Pitt and the other ministers arrange to have the Great Seal of the Realm affixed to a document instructing the Lords Commissioners to deliver the speech from the throne, without which Parliament could not legally operate. This technically illegal act (the Great Seal of the Realm cannot be affixed without prior consent of the Sovereign) opened the 1793 session of Parliament and the first item up for vote was the Regency Bill. The Royalist faction bitterly opposed the measure ("a glaring falsehood, a forgery, a fraud, a very palpable absurdity!!" they shouted from the floor of parliament), but the majority of Parliament had rallied behind Pitt and the Regency bill passed, making an unwilling Prince of Wales Regent and giving Pitt the latitude he desperately needed. Recognizing the fait-accompli of the Prussian occupation of Hanover, Hesse, and Mecklenberg, Great Britain agrees to peace with Prussia without any further terms or conditions. Pitt the Younger immediately opens a dialogue with the Prussian government in order to swiftly repair the breach in relations. Pitt the Younger's deliberate diplomacy bears fruit as Prussia and Great Britain pledge their allegiance. The Prince of Wales opposition to Parliament and bitterness over the Regency bill is great mollified by an agreement with Parliament to help pay off his substantial gambling debts; Parliament increases his yearly allowance by a hefty 65,000 pounds. Turkey re-affirms the Ottoman Empire, officially incorporating the re-conquered North African states into the Imperial system with Sultan Selim III at the head. Austrian troops finally decisively breach the walls of Munich and capture the city. King Charles IV of Spain, long disinterested in affairs of state, suffers a serious hunting accident and is officially indisposed. In his stead the liberal leaning Count of Aranda rules on as Prime Minister. Bavaria is officially absorbed into the Austrian Empire. The summer and autumn of 1793 were marked by peace and commerce, thinly masking a steady arms build-up in Europe. The conscript peasant army of France was drilled and trained and re-organized into formations of well-equipped regular infantry. The military expansion and the Directory's refusal to allow soldiers in training to return to their homes for the harvest contributed to crop failure and a very meagre harvest in France, significantly increasing tensions in Europe. By November already the drums of war could be distantly heard as both banks of the Rhine river became armed camps. Spanish Prime Minister Count Aranda is revealed to have several Imperial Russian agents as his top advisors. Aranda is arrested and confined to house arrest, and is replaced by Manuel Godoy, a firm royalist who is rumoured to have struck up an affair with Queen Maria Luisa during the King's long and difficult recovery. The French Directory new policy of supporting Spanish interests in Italy leads to the cessation of Piedmont to Spain; the Directory hopes that Spain will act as a buffer against Austria south of the Alps, thus allowing the French army to concentrate on Germany. With war potentially looming, Russia signs an alliance agreement with Austria and Prussia, and delivers stern warnings to Turkey that they are not to interfere with Austria. Their eastern borders thus secure, the Austrian and Prussian armies concentrate on the Rhine, amassing a large force at Freiburg in preparation for the expected conflict. French troops vacate the now-Spanish possession of Piedmont. Spain grants Piedmont "protectorate" status with it's own civil government; overjoyed Piedmontese celebrate in the streets. French troops move away from the Channel & North Sea ports and take up positions along the Rhine river. The Directory, sensing their increasing isolation and the growing relative power of their opponents issue a declaration of war on Prussia. Austria immediately declares war on France in support of Prussia. 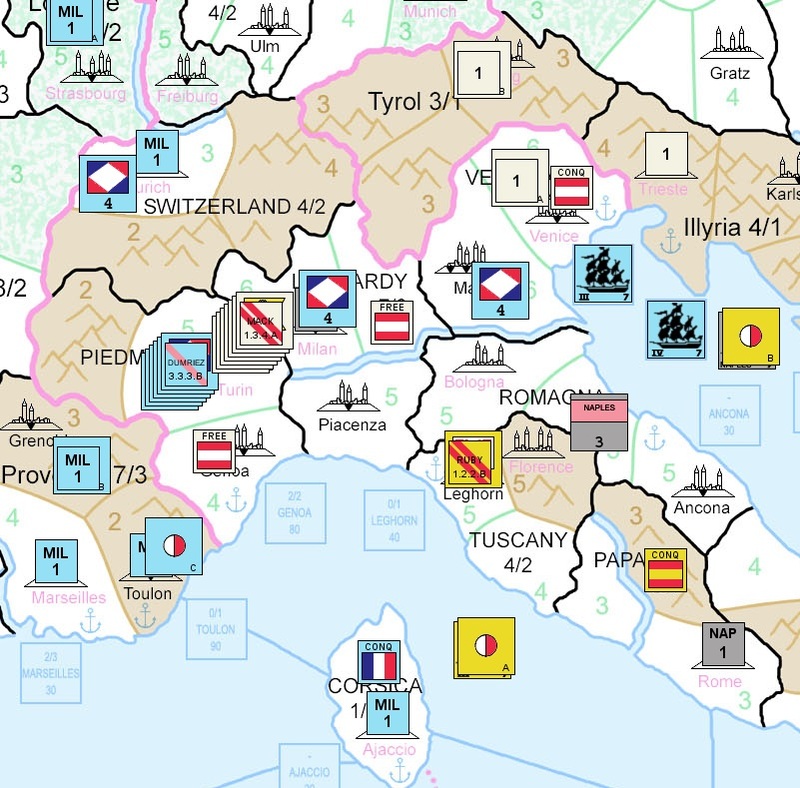 French fleets sail to blockade Venice and Trieste. The Emperor's pleasure yacht shall not be allowed to sail! Mack wastes little time in setting the main concentration of Austrian and Prussian troops in motion. 8 Austrian corps and 4 Prussian corps march north through Baden, crossing the Main river into Duchies before swinging west to meet the waiting French host at Frankfurt. Wurmser takes 4 Austrian corps and marches south to Zurich, capturing the city easily. 3 Prussian corps converge on III corps in the Hessian forest which fights a brief rearguard action against this superior force (Probe vs Defend, 2i Fr : 2i Pr) and withdraws in the night to join Pichegru at Wesel. The Battle of Frankfurt (9 Fr corps, 86i, 14m, 10c vs 8 Au, 4 Pr corps, 11g, 65i, 1m, 26c) opens with the Austro-Prussian force deploying for a rapid assault. Hoche elects to detach a third of his force, 4 corps, to flank the attacking columns but the French are taken off guard by the rapidity of the attack and take serious losses before the flanking force can arrive. For a time it seems the unexpected arrival of 4 French corps on the Austro-Prussian flank will unhinge Mack's battle plan entirely, however Mack spots a weakness in Hoche's line opened up by the chaos of the initial attack and immediately commits the Prussian guard while sending rapid fire orders to his brigade commanders to re-align their forces to meet the flank threat. By 2pm the battle is all but over as the French positions crumble and the flanking force is bloodily repulsed. Allied cavalry wreaks terrible havoc amongst the retreating French as they withdraw to Cologne in disarray [Guard committed 2nd round after French flank force arrival, Allies needed a 5 or 6 to win and rolled a 6, French needed a 6 and rolled a 5; Allies rolled a 6 for pursuit with 26 cavalry] (Assault vs Outflank, 25i, 14m, 4c Fr : 13i Au, 9i Pr) and Prussian troops re-occupy Frankfurt. Pichegru was unable to assist in the battle due to the garrison of Wesel attempting to break out (3i, 1c Pr : 2i Fr). The Russian detachment arrives in Erfurt after building a depot in Wittenberg. After reports that Hoche was trying negotiate an armistice after the battle, he is arrested and brought to Paris for trial on charges of treason and cowardice. Stung by the bloodiest defeat in the Revolution's short history, the Directory is not inclined to mercy, and after a brief show trial Hoche is sentenced to death. He is sent to guillotine before the end of the month. The Directory orders Pichegru to take command of the army and win a victory at any cost. Losses from June are offset by a fresh wave of trained infantry, but the cavalry losses cannot be replaced. Looking at his options in the face of a superior Allied force, Pichegru decides a change in tactics is needed. Taking his 6 best corps he marches rapidly south to attack Wurmser's inferior force at Zurich, while sending small raiding forces to attack the Austrian depots in Baden and Wurttemburg. Dumouriez takes 3 corps and retreats to Lille to observe the northern front. One French force is repelled by an Austrian Depot garrison at Ulm, but the other two detachments manage to destroy Austrian depots at Freiburg and Stuttgart, occupying those cities. Pichegru's attacks Wurmser with overwhelming force (6 Fr corps, 80i, 8c vs 4 Au corps, 5g, 29i, 5c), inflicting a bloody defeat (Echelon vs Counterattack, 4i Fr : 12i, 2c Au) and sending him reeling back to Ulm. Though the Directory is irritated that Pichegru did not engage the main allied force under Mack, they are happy to have a clear victory to bolster the flagging morale of the French people. The Lombard corps arrives on the scene and besieges a small French force in Freiburg. Wurmser moves north to attack the French corps at Stuttgart but the French withdraw successfully to Strasbourg. The main Austro-Prussian body crosses the Rhine to Cologne and invests the city, while 2 Prussian corps under Brunswick besieges Breda. 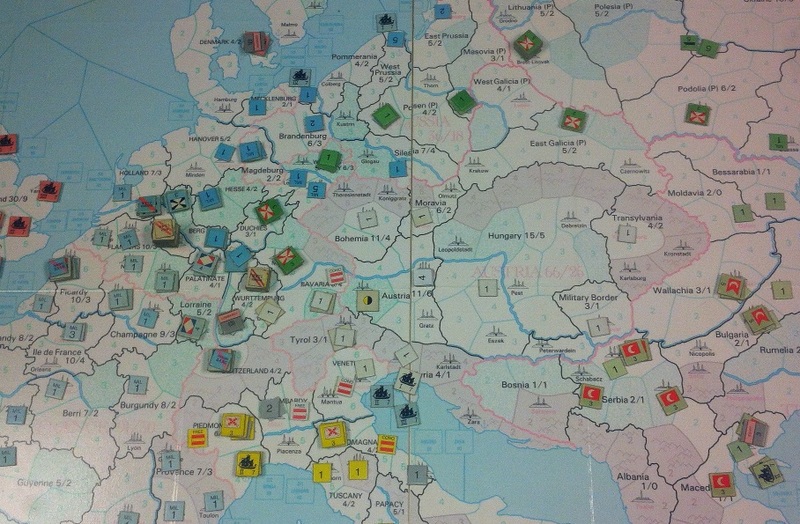 The Russians build a depot at Erfurt and send 3 of their 4 corps on to Nuremburg. GB expresses it's displeasure at the trade disruptions caused by the French blockades of Austrian and Prussian ports by partially embargoing trade with France (no trade with Le Havre, Antwerp or Amsterdam), otherwise trading with everyone. The Directory, displeased with Pichegru's caution, cast about for a new leader. They settle upon the aggressive young Jean Victor Marie Moreau, who gained recognition commanding the right wing at Zurich. To the Directory's chagrin, Moreau chooses to pursue Wurmser's battered command to Stuttgart instead of engaging the main body under Mack, detaching Pichegru with 2 corps to attack the Lombards at Freiburg. Pichegru drives back the Lombard corps from Freiburg, relieving the French corps besieged there (3 Fr corps, 23i vs Lombard corps, 7i, 1c; Echelon vs Defend, 2i Fr : 1i, 1c Lom). In the north, French troops capture Frankfurt (1i pr) in an attempt to disrupt supply to Mack's combined army. Moreau engages Wurmser at Stuttgart, where a small French garrison is under siege (4 Fr corps, 56i, 8c, vs 5 Au corps, 7m, 24i, 5g, 5c). Confident of his large advantage in numbers, Moreau launches piecemeal attacks all along the Austrian line waiting for a weak spot to appear. Despite heavy casualties the Austrians cling tenaciously to their positions throughout the day. Finally late in the day the Austrian positions start to crumble. Wurmser, sensing the crisis, commits the Austrian Grenadiers straight into the center, breaking the exhausted French troops. Moreau and his staff become involved in a wild cavalry melee as Austrian cavalry charge his position. With command & control temporarily gone the French army goes into full retreat, leaving the equally broken Austrians in control of the battlefield. Losses are heavy on both sides (Echelon vs Cordon, 10i, 1c Fr : 7m, 12i, 1c, 1g Au), with Moreau successfully withdrawing his army back across the Rhine to Strasbourg. The Directory, greatly displeased at this retreat, immediately recall Moreau to Paris where he is imprisoned awaiting trial. In a note of good news for the French fortunes of war, cracks start to show in the Russo-German alliance. The Prussians and Austrians accuse the Russians of being dilatory and condemn Russian diplomacy as being insufficiently anti-French. In return, the Russians accuse the Prussians of fermenting revolt in the Polish provinces with promises of a Prussian sponsored Polish state. As the bickering intensifies, the Russian army at Erfurt is observed withdrawing north to Wittenburg, dismantling their supply lines behind them, greatly diminishing the threat of their entry into the conflict. Before his departure, Moreau instructs his commands to dig in outside Strasbourg in preparation for the inevitable Allied counterattack and dispatches an appeal for assistance to Dumouriez, then just arrived in Zurich with 2 relatively fresh corps. Mere days after Moreau's departure, the combined Allied army under Mack descends upon the leaderless French army at Strasbourg as Wurmser throws his battered command against Pichegru at Freiburg. Pichegru (2 corps, 21i) expertly defeats Wurmser (3 Au, 1 Lombard corps, 14i, 4g, 4c) at Freiburg (Assault vs Defend, 3i, 1c Lom, 3i Au : 2i Fr) but is too heavily engaged to render any assistance to the main army at Strasbourg. Austrian troops retake Stuttgart (1m Fr captured), 2 Prussian corps assault Frankfurt but are repulsed by the French corps there (1i, 1m Pr : 2i, 3m Fr), and a token Prussian force attempts to take Cologne but is also repulsed. An Austrian corps destroys a small French screening force in northern Baden. (1m Fr). 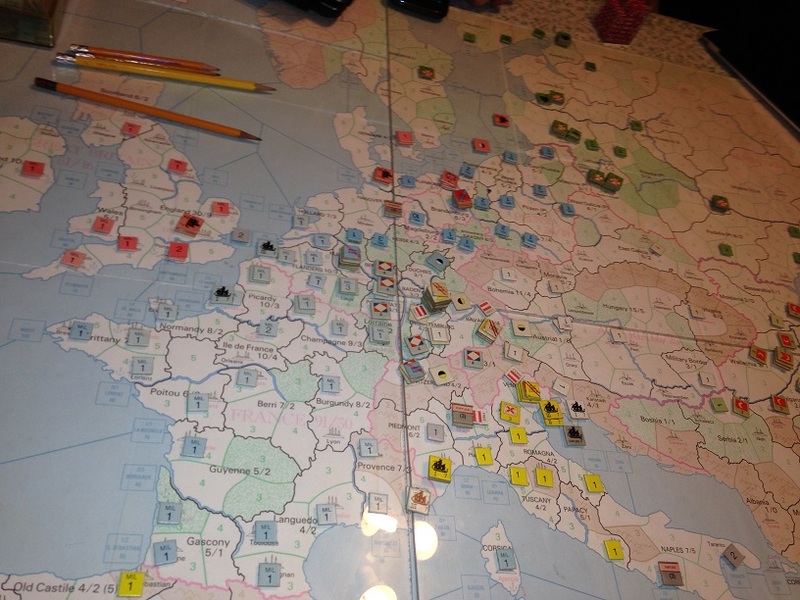 With great confidence, Mack commits his forces (8 Au, 4 Pr corps, 66i, 1m, 10g, 26c) into an all out assault on the four French corps (46i, 7c) at Strasbourg. Convinced that the inferior French force must break under the pressure, Mack sends in wave after wave of infantry assaults against the French field works and redoubts, but the difficult terrain and the strong French position confound the Allied attacks. French morale remains high as the day wears on, hotly contesting every inch of ground, despite mounting losses on both sides. By late afternoon, Mack receives word from his scouts of the imminent arrival of 2 fresh corps (24i) under Dumouriez having marched with all haste from Zurich. Realizing that the French were far from broken and his advantage was being quickly worn away, Mack orders the Prussian guard into a direct assault. With fresh French infantry formations reinforcing the defensive redoubts, the attack quickly falters. Seeing the Prussian guard turned back so easily spreads panic through the Allied ranks, and as Dumouriez takes control of the army and starts launching counterattacks the Allied army retreats into the gathering dusk in disarray (Escalated Assault vs Defend, 6i, 1c Pr, 10i Au : 15i Fr). Mack withdraws his force across the Rhine to Ulm to re-establish supply. On the home front in France, the National Convention stages a coup against the Directory and Robespierre is arrested and executed along with his Jacobin cohorts, ending their reign of terror. Moreau is freed immediately and his general strategy and that of Pichegru is endorsed by the new regime. Nevertheless, Moreau remains in Paris to help organize the new government and embark on diplomatic efforts that would soon bear fruit. Great Britain, citing the illegal occupation by Prussia of Hanover and Hesse, declares war. With relations already strained, Prussia demands Russia honour their alliance and join the war against Britain. Russia issues a cold refusal, closing their embassy in Berlin and withdrawing their ambassador and staff. The French garrisons of Frankfurt (1i Fr) and Cologne (1m Fr) are starved out. Pichegru assumes overall command of the army once more and decides to take the fight to the Prussians, leading 4 corps to Frankfurt to attack the small force under Brunswick that just captured the city. Dumouriez is ordered to Liege with 2 corps to attack a Prussian corps there, with additional corps being sent to besiege Cologne and Kessel. 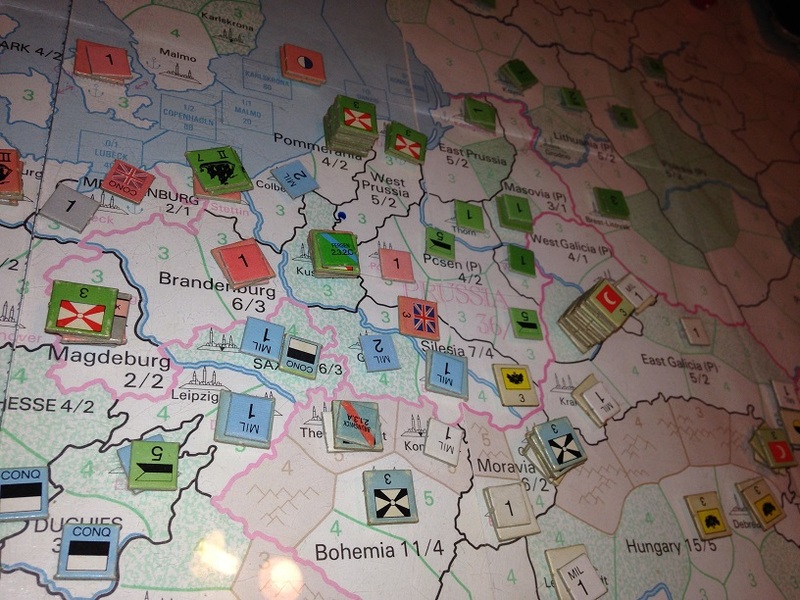 The still powerful main Allied army under Mack at Ulm is carefully screened from interfering in these moves. Dumouriez defeats the Prussian corps at Liege (Echelon vs Escalated Counterattack, 2i Fr : 2m Pr), while Pichegru compels Brunswick and his troops to surrender at Frankfurt after a brief siege (7i, 5m, 5c, Brunswick captured). The four Russian corps in Wittenberg march to Posen, following their supply line back to Russia. 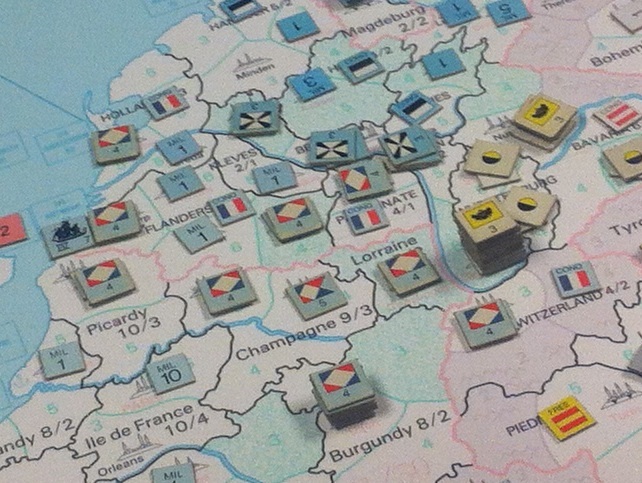 Mack marches his reorganized and resupplied army north in pursuit of Pichegru, destroying a small French delaying force in southern Duchies (Trivial, 5i Fr : 1i Au). Wurmser sieges Freiburg with 3 corps, while another Austrian corps and the Lombard corps assault and capture Zurich (1m Fr). Great Britain lands 5 corps at Stettin, laying siege to the city. The new French Directory's diplomatic efforts bear fruit as Spain declares war on Austria, perceiving that the time is ripe to complete their conquest of Italy. Austria calls upon Russia to honour their alliance, but as with Prussia before the call is flatly refused and the Russian embassy in Vienna is similarly recalled. Exploiting the rift in German-Russian relations, France concludes a treaty of friendship with Russia. With Spain successfully brought into the conflict, Russia neutralized, and a co-belligerent Great Britain, French fortunes had greatly improved, and the German Allies had become increasingly isolated. 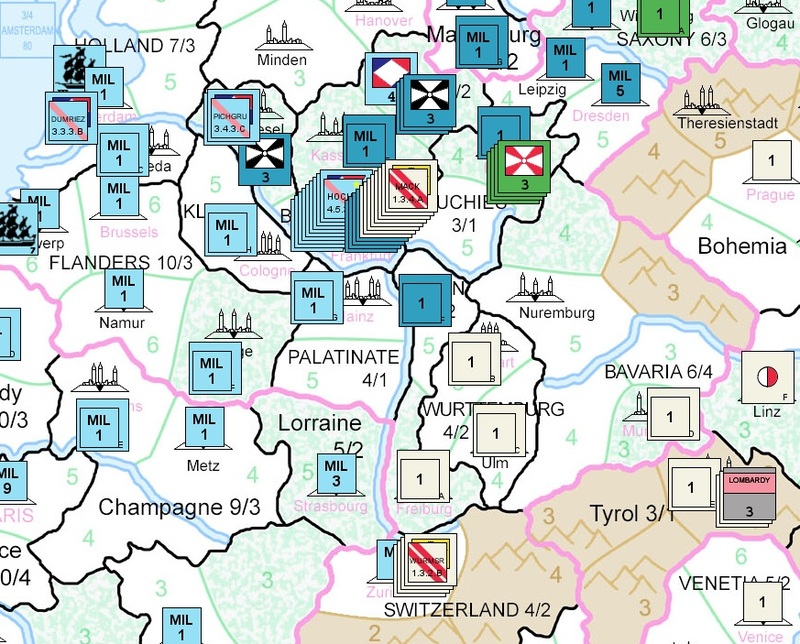 Continuing his strategy of attacking where the Allies are weakest, Pichegru marches south, bypassing Mack and attacking Wurmser once more at Freiburg (4 Fr corps, 56i, 7c vs 3 Au corps, 27i, 4g, 4c). Although the French attack inflicted casualties to negligible losses, the Austrians held firm throughout the day and were able to withdraw during the night to Ulm (Probe vs Cordon, 0 Fr : 6i Au). Dumouriez simultaneously lays siege to Zurich with 2 corps, assaulting the city but ultimately being repulsed by the Austrian and Lombard defenders (4i Fr : 7i Lom). French forces destroy a garrisoned Austrian depot in northern Baden (1i Au) and lay siege to Nuremburg. Mack marches south once more into northern Baden, a small French delaying force successfully withdrawing before him. Wurmser marches to Stuttgart within supporting range of Mack's army and lays siege to the French garrison. The garrison of Stettin starves out (1i Pr) while the Austrian corps trapped in Zurich suffers losses as well (2i Au). General York leading the British force at Stettin, having secured the port, marches 4 of his corps inland and besieges the Prussian capital of Berlin. A Prussian sortie inflicts some casualties (1i Gb). Spanish troops disembark at Venice, linking up with an army led by Ruby marching from Romagna. Spanish troops occupy Mantua and Piacenza, and Ruby successfully assaults Venice, destroying the garrison and capturing the city (1i Au). French troops take Munich after suffering some attrition (1m Fr : 1i Au). Dumouriez captures Zurich, accepting the surrender of the defending Austrian corps (1i, 1c Au captured). The main army under moreau marches on Cologne, capturing that city (1i Pr captured). Wurmser counter marches on Munich, driving away the French corps there and recapturing the city (1m Fr). The main Austrian body under Mack marches to Stuttgart and lays siege. Despite great hardships for the population and garrison of Berlin (3m Pr lost foraging), the defenders manage to repel a major assault by York's redcoats at great cost (5i Gb : 12i Pr). To the west, the Danish corps assaults Hanover, taking the city after a difficult fight (2i Dan : 4m, 1i Pr). The last Russian troops exit Prussia, joining an ominous concentration of Russian power in Lithuania. After several weeks of diplomatic wrangling, a peace agreement is signed at Geneva between the Franco-Spanish alliance and the German powers. Austria agrees to hand over Lombardy and Illyria to Spain in exchange for return of Baden by France and monetary reparations. Prussia agrees to cede Hanover to France and sign an extended non-aggression pact. An armistice between French and Austrian troops is signed while the troops withdraw to their own territory and the details of the peace are hammered out. The Prussian contingent of the combined German army breaks off and marches north to Erfurt. Brunswick and some 30,000 Prussian troops recently released from French captivity march to Kassel. Russian troops flood across the Prussian border. 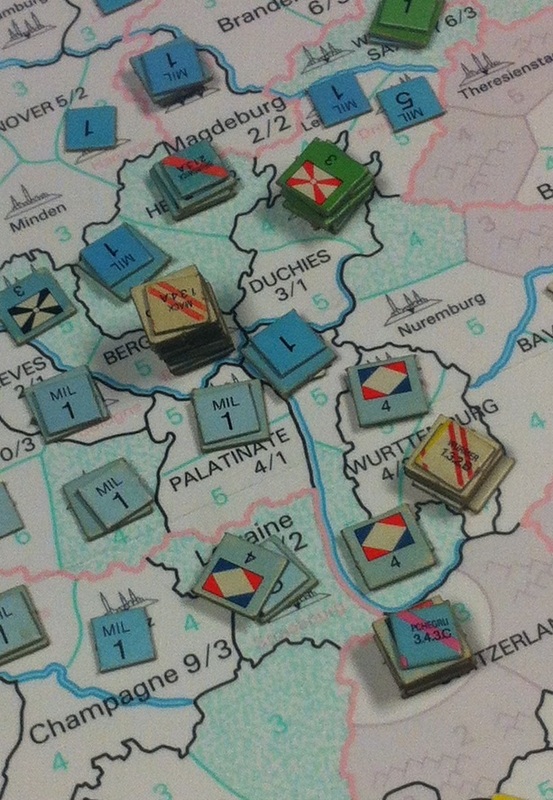 Fersen with 4 corps assaults Konigsberg, capturing the city (2i, 1m Pr captured). Thorn and Warsaw are similarly assaulted and captured (1i, 3m Pr). The Russian fleet unloads two Russian corps into the British controlled port of Stettin, as the Danes move north to Mecklenberg, capturing Lubeck (1i Pr captured). With the Geneva treaty finally ratified and put in force, the French, Spanish, Austrians and Prussians sign a treaty of friendship and mutual cooperation in the hopes of staving off another European bloodbath. Austria and Turkey sign a treaty of mutual assistance. Turkish troops enter Transylvania and Galicia, marching northwest through Austrian territory apparently at the invitation of the Emperor. Prussia marches 4 corps to Theresienstadt in Austria as the Austrian army marches north through Bohemia. Brunswick and his two corps march south into Bavaria out of reach of the British and Russian forces around Berlin. An Austro-Turkish army starts massing in West Galicia, as the Prussian army marches west inside the Austrian frontier to join them. Austrian and Turkish intervention to save Prussia now seems like an inevitability. The conflict expands as Austria and Turkey declare war jointly on Russia. Great Britain declares war on Turkey to support their Russian ally but maintains it's peace with Austria for the moment. Suvarov arrives in Pomerania to take command of the main body of Russian troops while York takes charge of the siege of Magdeburg. Mack and Wurmser arrive at the front to take command of the Austro-Turkish forces. British troops from Malta are conveyed to Tunisia under cover of the British Navy. After a successful landing they take Tunis in short order. Turkish and Austrian corps enter Russia, destroying supply depots and raiding the countryside as far north as Kovno, capturing Grodno and Brest-Litovsk. Mack links up with the Prussian army at Breslau, uniting a force of 5 Prussian, 4 Austrian and 3 Turkish corps. Additional Turkish corps steadily march north through Galicia. Brunswick leads a single Prussian corps to Berlin, destroying a British depot and recapturing the capital under the nose of the Anglo-Russian army (2i Gb). Austrian troops liberate Warsaw (1i Ru captured). Suvarov, realizing his supply lines are dangerously compromised, orders his troops to concentrate on Berlin where supply can still be brought in via Stettin and Lubeck. An overwhelming force of 8 Russian and 4 British corps arrives at Berlin, prompting the surrender of Bunswick and his corps (9i, 3c Pr) and putting the city once more under Anglo-Russian control. Austrian and Turkish corps move from Russia into eastern Prussia, retaking Konigsberg (1i Ru captured) and Thorn (1i Ru) and starving out the Danzig garrison (1i Ru). The Austrian Light Infantry catches a cossack brigade outside Koniggratz and destroys it. A secondary Turkish army of 4 corps under the Grand Vizier masses in Bessarabia. 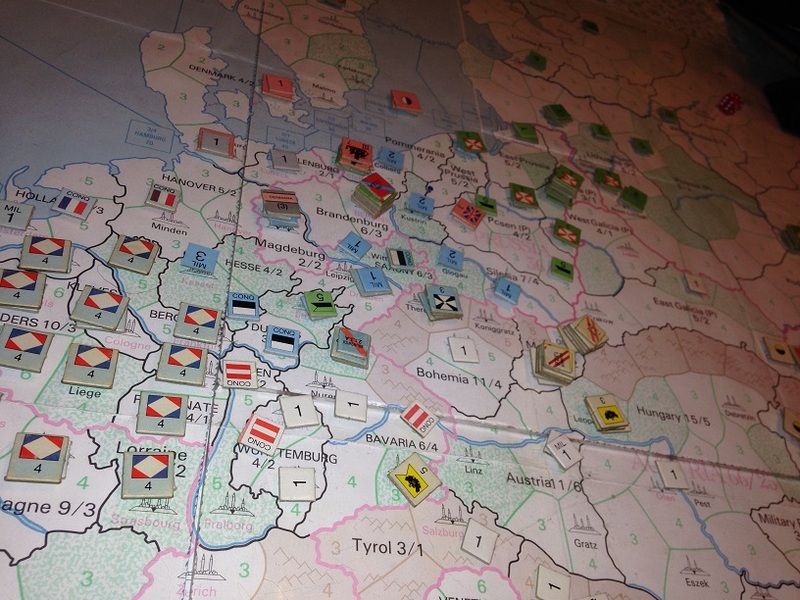 Mack marches his combined force from Breslau to Glogau, threatening Berlin. Suvarov focuses on securing his perimeter and establishing proper supply, sending a corps to capture Colberg (2m Pr) and another detachment of 2 corps to attack the Austrians at Danzig, forcing the surrender of an entire Austrian corps after a bloody assault (3i Ru : 4i Au; 7i, 1c Au captured) The British take Kessel with a tiny force of redcoats, defeating and capturing a garrison of militia 3 times it's size (3m Pr captured). The Danes break into Magdeburg but are repulsed (1i Dan : 1m Pr). Catherine the Great falls into a coma after suffering a severe stroke while on the toilet. The Imperial court is thrown into disarray by this event and command and control of the army suffers. Documents indicating that Catherine intended her grandson Alexander to succeed her instead of her semi-estranged son Paul come to light, threatening to trigger a succession crisis. British troops from Tunis arrive off the shores of Tripoli, landing and making short work of the garrison. Mack marches on Suvarov at Berlin as skirmishing forces advance to try and interdict Anglo-Russian supply. A Turkish feudal corps force marches to Lubeck, capturing the city from the British garrison (1fi : 1i Gb captured), while a Prussian corps lifts the siege of Magedeburg, driving off the Danes (Echelon vs Defend, 1m Pr : 1c Dan, Danes break 1st round). An Austrian corps moves to Prussian-held Kustrin on the right flank of Mack's advance. Wurmser marches north to Vilna at the head of 2 Austrian, 1 Egyptian and 1 Turkish cavalry corps to attack 2 Russian corps there; the Russians are caught badly unprepared (Echelon vs Defend, 1i Egyt : 20i Ru, Russia breaks 3rd round, suffering 6 pursuit losses) and although fighting lasts much of the day, the Russian infantry is badly outmaneuvered and broken, chased down by Turkish and Egyptian cavalry and destroyed utterly as an effective fighting force. To the southeast, the Grand Vizier advances on Kiev, leaving a detachment to starve out the Nemirov garrison (1i Ru). Kovno is under siege with some starvation amongst the defenders (1i Ru). 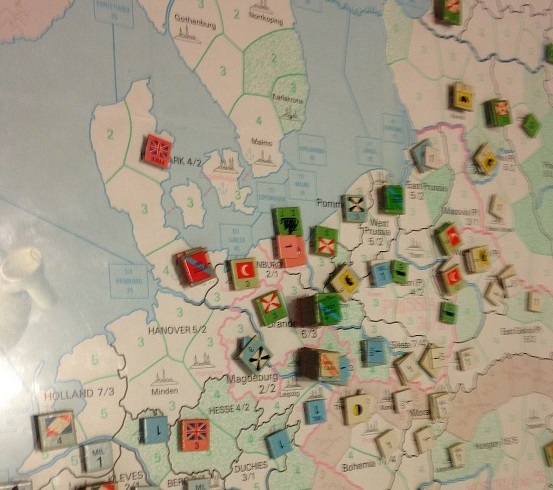 Mack commits 11 corps (4 Pr, 4 Au, 3 Tu) to attack Suvarov's 12 corps (8 Ru, 4 Gb) at Berlin. 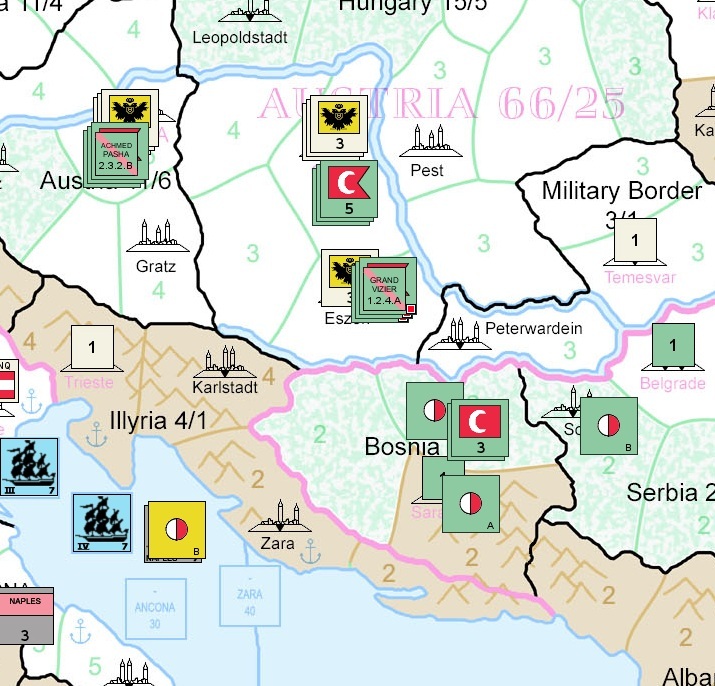 Mack's battle strategy is cautious, a stance that pays off as Suvarov's powerful flank attack is detected early and bloodily repulse over the course of several hours. The Allied force suffers minimal losses however the flank attack turns into a creeping envelopment. Realizing that the tactical situation is deteriorating and facing superior Russian numbers, Mack commits the Prussian Guard in the late afternoon in a last ditch attempt to break Suvarov's center, but this attack also is repulsed. Mack realizes he must withdraw; the slow compression of the Allies position makes this maneuver difficult and army cohesion is lost as units begin retreating as best they can. Russian and British cavalry harrass the retreating Allies all the way back to Wittenberg where Mack manages to rally his troops (Probe vs Outflank, 1fi, 1fc Tu, 1m, 1c Pr, 1i Au : 11i Ru, 8i Gb, Allies break 3rd round after guard committal, suffer 2 pursuit losses). Anglo-Russian casualties are relatively severe but with the Allies in full retreat Suvarov immediately plans a counter-attack on his own initiative. After a brief pause to reorganize and deal with the threats to his supply lines, Suvarov follows on the heels of the Allied army to Wittenberg. Fersen takes two corps to attack the Austrians at Kustrin on the left wing, driving them into the fortress. A quick assault is repulsed (3i Ru : 1m Pr, 2m Au). York and the Danes, stiffened by British troops, attack the Turks at Lubeck, defeating them after a short violent fight (Assault vs Counterattack, 1i Dan : 4fi Tu). His flank secure, Suvarov advances with confidence on the Allied army at Wittenberg, pitting his 11 corps into a head on attack against the spread out Ausrians, Prussians and Turks. The thin cordon Mack had managed to establish is swept aside by the attacking columns and the Allied troops are forced back through the forested countryside. The difficult terrain impedes the Anglo-Russian army somewhat and prevents them from delivering the killing blow, and ultimately Mack is able to withdraw his battered units in good order before nightfall allows him to break contact and retreat to Glogau (Assault vs Cordon, No Ru/Gb losses : 4fi tu, 9i Pr, 6i Au, no break, Allied army withdraws at night).